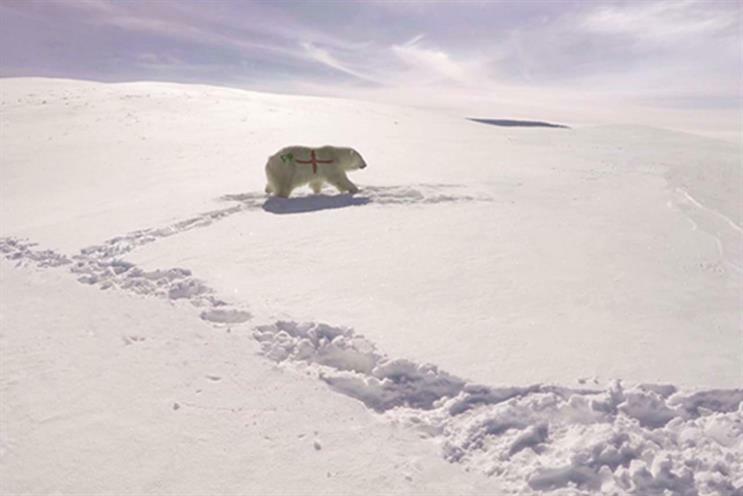 Paddy Power has revealed that a print ad this week featuring a polar bear apparently graffitied with a St. George's Cross were a hoax, designed to draw attention to the plight of the animals in Russia. The stunt drew outrage online, while Atomic creative partner Dave Henderson, in an opinion piece for Campaign, suggested the people behind it should be "hanging their heads in shame". But the brand has now revealed that the idea was a collaboration with the NGO Polar Bears International, and the supposed cross was faked. The bear in the photo, Agee, was actually filmed on location in Canada. Paddy Power, meanwhile, is funding what it said were two groundbreaking research projects for PBI to help the scientific community improve its knowledge around polar bears in Russia, where they are especially threatened by oil drilling. The campaign was created by Pitch Marketing Group. Writing in Campaign today, Paul Mallon, head of major brand activations at Paddy Power Betfair, took the brand’s critics head-on, saying: "So, by all means, accuse us of bad puns, being offensive, or being morally bankrupt. We don’t mind offending Gant-wearing, snooty agency types." A spokesperson for the brand, meanwhile, said: ""We are sorry that you were upset by the image. We need more snowflakes like you guys in the world – albeit in the Russian Arctic rather than on Twitter." Geoff York, spokesman for PBI, added: "We realised this was a unique opportunity to draw attention to the plight of polar bears across the Arctic, especially in Russia where we know little about the health of polar bear populations. The donation from this campaign will support new research in the Chukchi and Barents Seas – two important populations shared with Russia." Is it fair game for Twitter to sell off a hashtag like #ItsComingHome? Has Paddy Power's 'shockvertising' run its course?